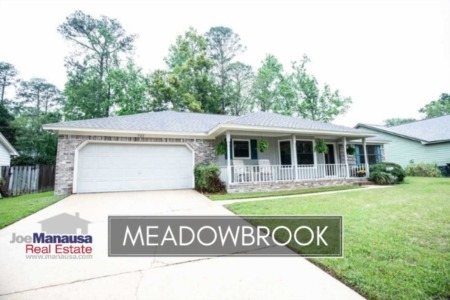 Meadowbrook is a popular NE Tallahassee neighborhood that had a huge breakout year in 2016. Featuring nice sized homes on quarter and third acre lots (inside of Capital Circle), buyers here have been getting tons of value over the past few years. After seeing a huge jump in home values last year, Meadowbrook has begun the 2017 year on a much slower pace. Values shot up so high last year, some of the "sizzle" has worn off and it will take buyers a while to realize that current values are still very attractive when you consider the alternatives in the market. 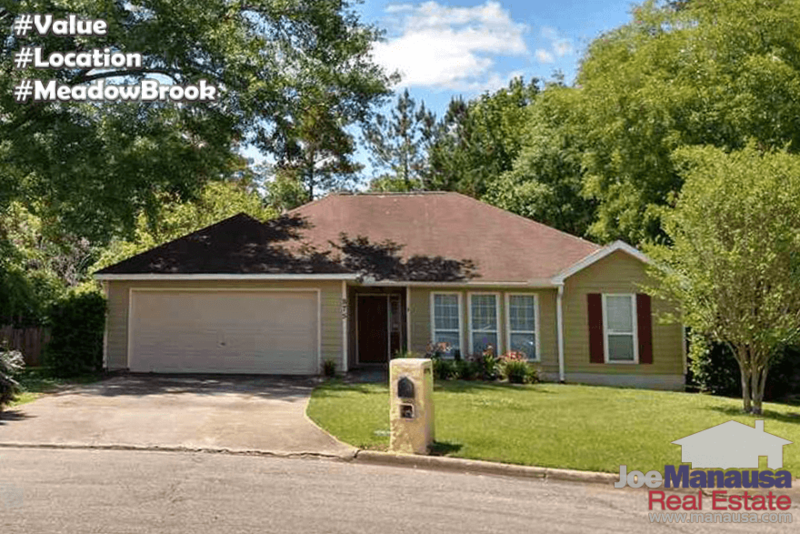 While the days of stealing one of these are finally over (see my "I told you so" previous reports when values were below $100 per square foot), there are still great opportunities to be found in this popular Northeast Tallahassee neighborhood. It is important to note that the narrative contained below is for sales through December for all previous years, and through the first week of April in 2017. The graphs and the closed sales table will be continuously updated into the future (meaning bookmark this page if you always want to know the current status of homes in Meadowbrook). Average home prices in Meadowbrook have softened roughly 6% this year. The average home sales price is $175K thus far in 2017, still far higher than what we observed prior to last year. Home sales activity in 2017 has slowed down (understatement). After an 11 year high for sales in 2016, this year has not seen the continuation. 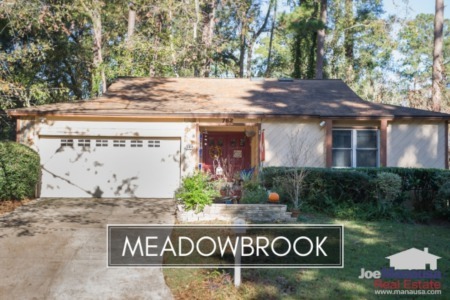 Currently, there are three homes for sale in Meadowbrook and none of them are under contract. Average home values in Meadowbrook exploded 20% higher in 2016, so the slight decline thus far in 2017 is likely nothing to be concerned about. The fact is that Meadowbrook had been undervalued for years, and it took until 2016 for buyers to figure that out. Meadowbrook remains a highly desirable location. Homes that are marketed properly should sell right away in our current, low-inventory market. Through the writing of this report, home values have averaged $107 per square foot in 2017. This remains 20% below peak of the market values recorded in 2007, so there is still a lot of room left for buyers to get a heck of a deal before we see the recovery completed. Thus far in 2017, the average size of the 2 homes sold has been 1,639 square feet. The following list shows more than 400 home sales in Meadowbrook going back to 1991. I hope you enjoyed our April 2017 update on home sales in Meadowbrook, please feel free to CLICK HERE to drop me a note if you have questions not covered in this report.